In this light-filled kitchen with the cleanest of lines, everything is new – from the warm, rich floors and commercial, stainless steel appliances to the modern pendant, ceiling fan and pre-fabricated cabinetry. Recessed ceiling lights and under-cabinet light mounts add to the views in and around this newly-configured space. The view from the sink reveals a new wall to the right, behind which rests a newly constructed powder room. To the left lies the family room and front entrance beyond. The modern pendant fixture (and ceiling fan in other photo) lend a polished air to this bright room and coordinate nicely with the other appointments. 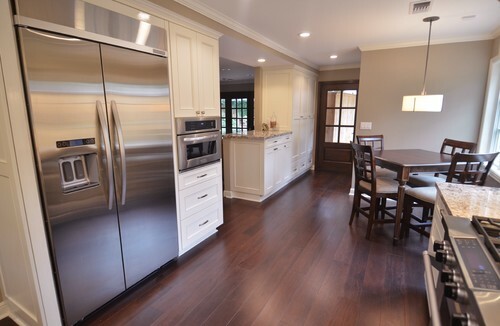 Before leaving the kitchen area, please take note of the craftsmanship in cabinetry that completely envelops the vent hood, leaving no trace but function. 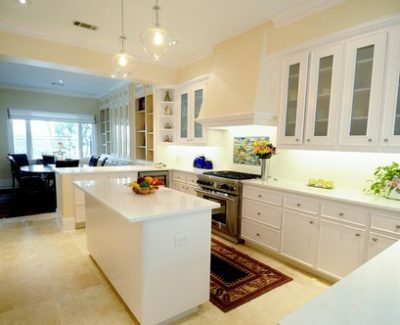 Also take note of the beautiful milk glass, small subway tiles of which the backsplash is composed. Their creamy presence as a backdrop is yet another feature that makes this kitchen sing a stream-lined song. This lovely new powder room was non-existent before its’ walls were erected, part of the house’s overall reconfiguration. 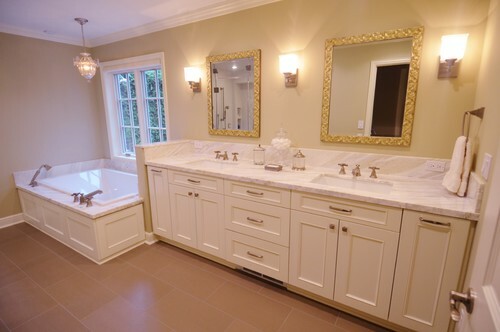 Now a convenient rest-stop for guests, it boasts a classy rectangular under-mount sink below a stone counter and wall-mounted faucet and handles below a gilt-framed mirror. 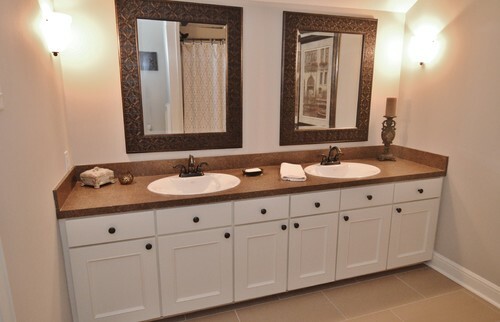 The height of luxury and function, this tasteful Master bath meets the needs of the owners with panache. 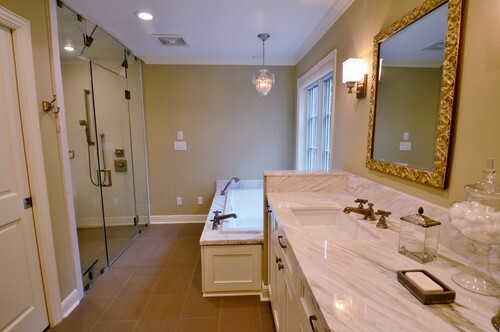 Gorgeous marbles mixed with wood, glass and gilded frames, plus a crystal pendant over the tub and large format porcelain tile on the floor combine to make this a bath room to remember. 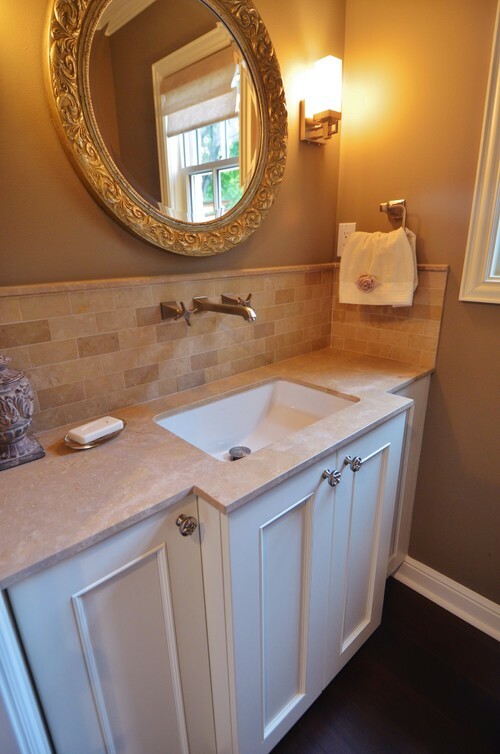 Day-lighted by a generous new Pella window, this sumptuous tub supports a deck of marble like that covering the countertop and shower bench seat. Additionally, there is a hand-held spray unit for ease of rinsing. Rectangular under-mount sinks echo the shape of the tub and deck. Also take note of the toe-kick heater vent that is just right for those who want some warmth under and around their feet. The large format porcelain tile underscores the full extent of the floor space, even into the shower. 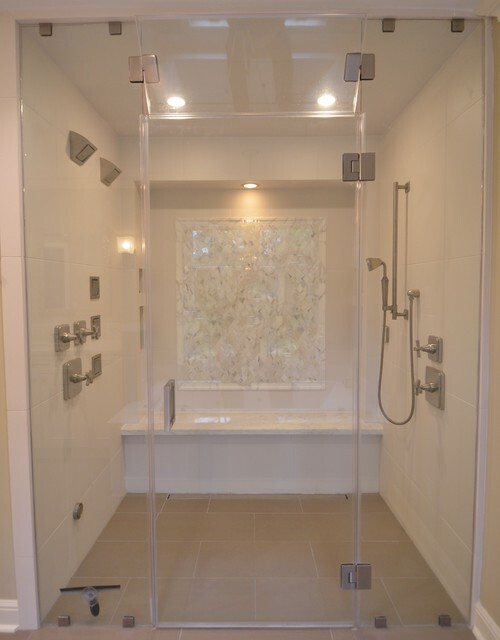 Score a direct hit for this walk-in shower – with no curb it is ready for aging-in-place considerations. 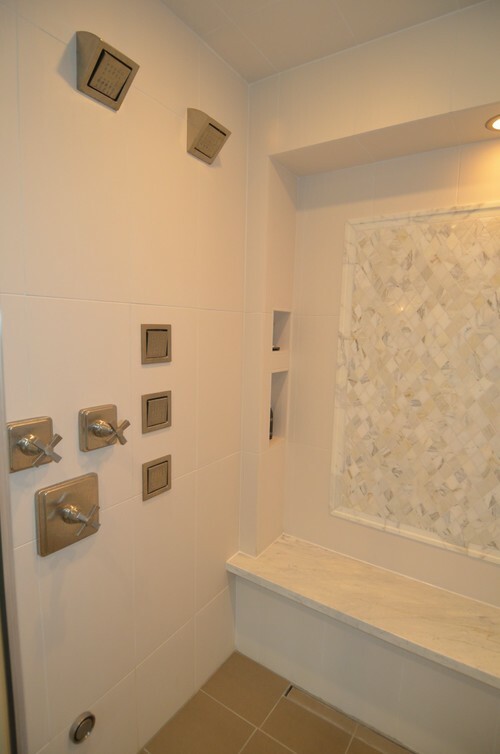 Decked out with Kohler’s multiple body sprays, a hand-held shower head on a slider bar, and a Roma steam unit, this shower drains with a horizontal grate drain near the bench. 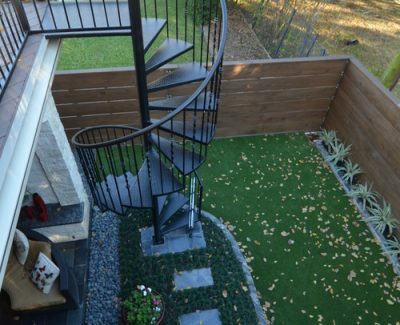 Calculated to eliminate any possibility of water escaping, the same floor material was designed to slope gently and efficiently into the almost-hidden drain. A pivoting transom allows steam to escape at the appropriate time, when the high cfm vent fan nearby is activated. The beauty of the shower is enhanced by an illuminated marble wall mosaic and a marble-covered bench upon which to contemplate it. Is function following form in this shower? Here we can see the beautiful marble wall mosaic to full effect with its’ wash of illumination from above. Equally well-lit are the shampoo niches on each side of the marble-covered bench. The body sprays and controls follow a logical pattern all the way down to the steam nozzle at the bottom left, leaving it to the bather’s preference as to what to enjoy first and last. In this Master bedroom closet, the custom cabinets, drawers and adjustable hanging sections have been designed for maximum flexibility and lit for optimum exposure. The beautiful marble has been carried over from the bathroom above the chest of drawers, suitable for folding clothes or holding precious family mementos. 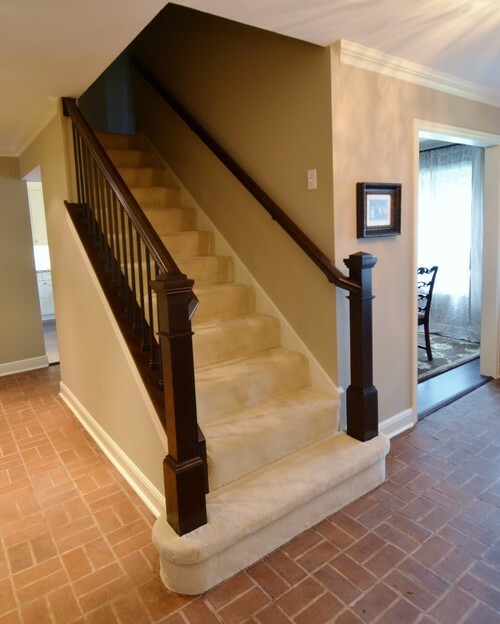 A newly wrought staircase of wood, iron and plush, creamy carpet enhances the ascension from a refinished floor. 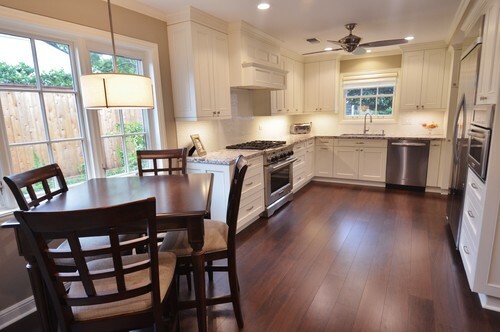 All of the paint and crown mouldings are new as well in this remodeled home. This countertop of this guest bathroom attests to the fact that laminate can be beautiful when thoughtfully paired with coordinating framed mirrors, bronzed fixtures and hardware, and porcelain tile. 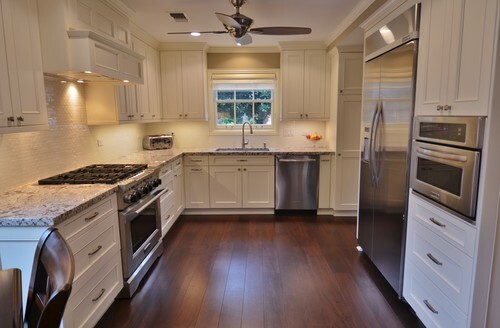 The levered handles are a good feature for universal design.